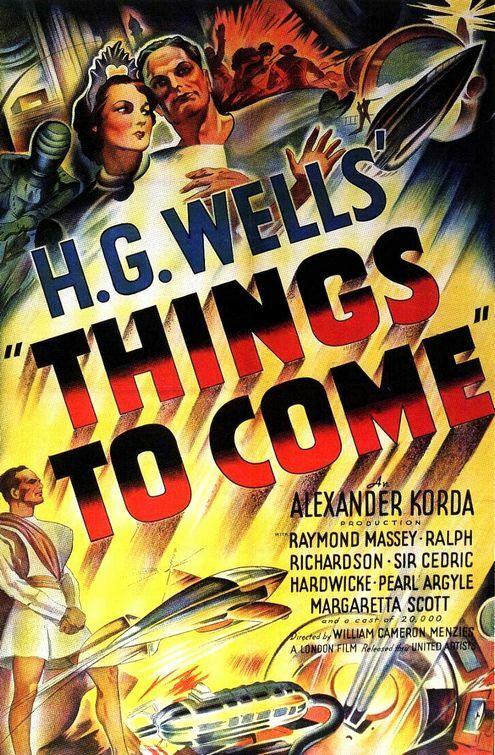 Things to Come - the 1936 adaptation of HG Wells' novel The Shape of Things to Come - is an odd film, a combination of wonderful visual wizardry and sense of scale with an awfully stilted and preachy narrative about how socialist-tempered scientific progress is the eternal saviour and great equalizer of mankind. It reminds me a fair deal of Fritz Lang's Metropolis, but less expressionist. To summarize the unwieldy narrative: The aftermath of a hypothetical Second World War (an uncomfortably close prediction, as history would reveal) brings most of civilization to its knees and nation-states are reduced almost to tribe-like status, with constant infighting and resource shortage pushing them back to the dark age. Somehow in all this an organization called Wings over the World (WotW) has managed to scrounge enough resources for technical superiority and aims to end warfare and unite mankind. Their representative (Raymond Massey) comes to the archetypical "Everytown" where he is thrown into prison by the local Boss (Ralph Richardson, in a performance of utter cartoon villainy). When a renegade engineer passes on this news to WotW, they come in their sophisticated bombers and drop a "gas of peace" which puts everyone to sleep, and then take over with their benevolently dictatorial agenda of peaceful scientific progress. Cut directly a 100 years ahead to a utopian future, where people live in huge white cities with multi-storey screen displays (Here's looking at you, Blade Runner), poverty and discomfort have been eradicated, and everyone wears togas because apparently the Greco-Roman look is future chic. The scientific head honcho (Massey again, as his own descendant) wants to launch people into space to further the possibility of landing on and someday inhabiting other planets, and his own daughter volunteers (along with a friend's son). But some (rather curmudgeonly portrayed) people are tired of this ceaseless innovation and want the government to stop with unnecessary, perhaps even blasphemous scientific progress, even if it means physically attacking the launch cannon for the space ship (Yep, the rocket is shot off from a giant barrel). Science vs People debates issue forth while the two sides face off against each other till the rocket is launched off. 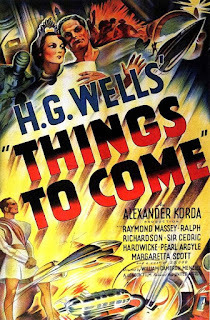 The film ends with a grandiose monologue on the greatness of scientific progress in which Massey asks his friend (and the audience, one assumes), "All the universe or nothingness? ... Which shall it be? ..."
Wells himself wrote the initial treatment and intended to personally steer the production in a manner he felt his work ought to be presented. But he soon discovered the discrepancy between his imagination and the realities of film production (and according to at least some members of the film crew, mostly just stood around and showed more interest in flirting with the women on set). Many crew members that signed on because they admired Wells' novel were rather surprised to find its well-rounded characters and erudite dialog reduced to caricatures and blatant speeches. William Cameron Menzies whose major claim to fame was as a skilled art director, works manfully to bring at Wells' reportedly often vague vision to life, and thus provides the film's strongest asset. The scenes showing wide vistas of archetype futuristic urban-scape are often marvellous (even if the optical work is somewhat obvious now), depicting large populations of people dwarfed by gargantuan sleek structures, and the climax featuring a mob attacking the rocket launch cannon is excitingly staged. People who liked or admired Metropolis should definitely check this one out as well.